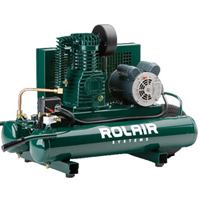 The Rolair 1-1/2 HP (115V) 7.3 CFM at 90PSI, 9-gallon twin-tank compressor is a heavy-duty machine capable of running various pneumatic tools simultaneously. 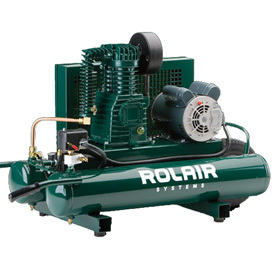 This Rolair compressor’s single-stage pump features two cast-iron cylinders, splash lubricated ball bearings, valve plates of hardened steel and connecting rods of aluminum alloy for long-lasting performance. The pump operates at a low speed and the quiet operation reduces onsite noise. This 1-1/2-HP compressor motor runs at 1755 RPM, on 115 or 230V, and has thermal overload protection and a manual reset for extra safety. The unit weighs 150 pounds and has one 10-inch diameter wheel for easy mobility. This Rolair twin-tank compressor operates between 110 and 135 PSI and the pressure gauge marks from 0 to 200 in 5-pound graduations for exact pressure control. Pump Oil Capacity: 34 Oz.